We have made it through the wilderness, you know we made it through...(are you singing along with me yet?) It's hard to struggle with the Israelites through their rebellion and wandering years—most likely because they remind me too much of myself. If you've been reading through *most of the Bible in a year with us, you might be feeling the same way. 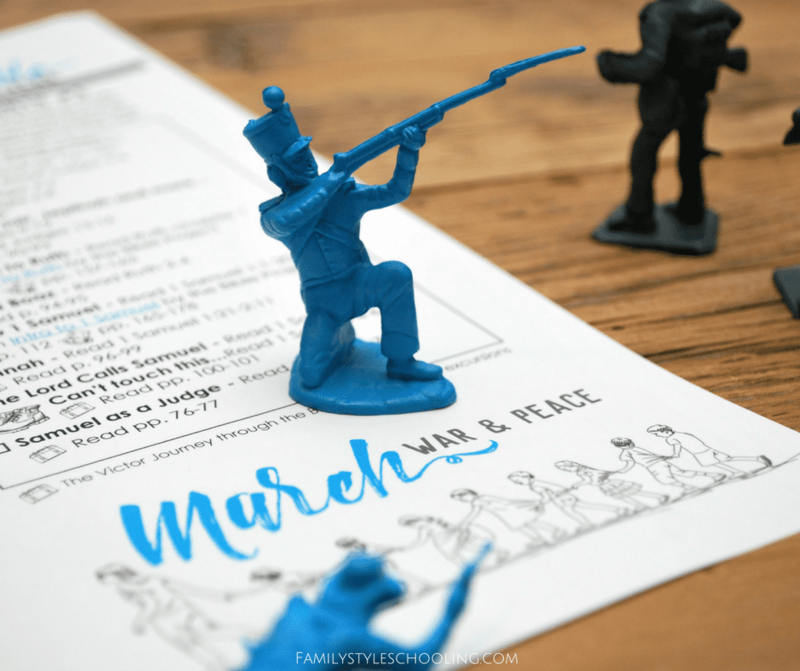 I'm ready for a break in the Israelite's struggle, but peace doesn't come without a fight. The next twenty points of interest follow a new generation of warriors that have grown up in God's presence and are ready to follow him—mostly. You'd think that after they get the long promised land, that things would settle down, and we could just end with: "And they all lived happily ever after." However, the book of Judges tells a different story. War and peace are hard on the soul, and if you don't keep your eyes fixed on the Lord, your faith will fail. 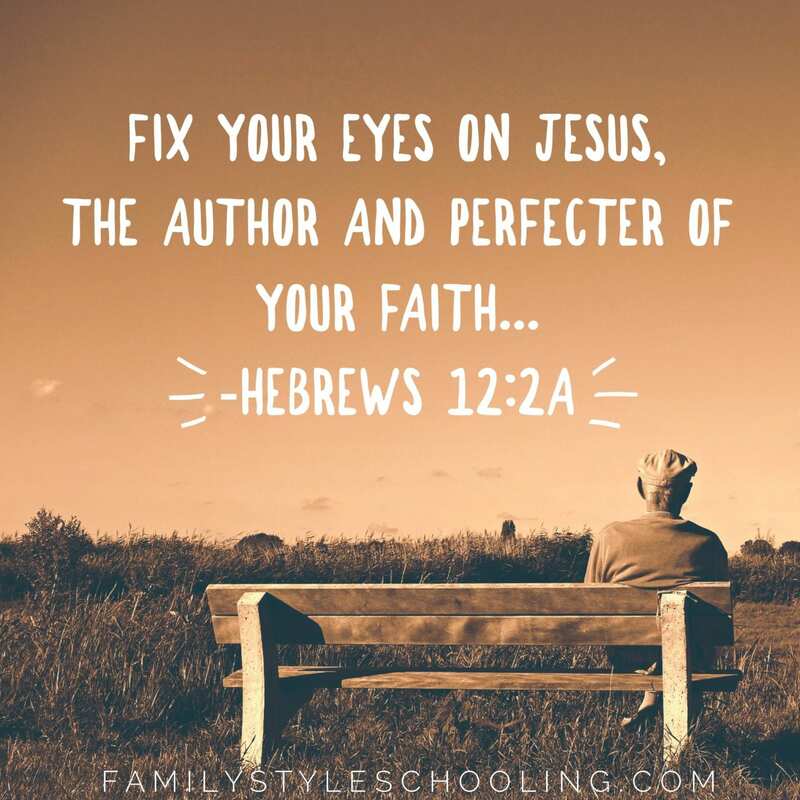 Just like the Israelites, we can get distracted from following Jesus when we fix our eyes on our circumstances and not on Him. Every single person struggles with this concept. It's part of what makes us human! War - This can be anything from fighting within your family to disagreements with friends to countries at war. Any time conflict arises, it can really vie for your attention. Famine - While Americans are hardly lacking in anything, there are times when finances are thin, and you don't know where the next meal will come from. This can cause great stress and distraction! Loss - As you get older, it seems the losses increase...loss of relationships, loss of jobs, loss of health, loss of reputation, loss of income...there are so many opportunities for dashed expectations that fight for your focus. Wealth - If you are not concerned about counting down the days until your next pay check, you can start to think that you're actually the one making the money rain! When you can buy more things, you open the door to countless additional distractions. It's not bad to own things, but it's easy to get sucked into those very things owning you. Peace - Peace is a dangerous monster. It leads you to believe that you can relax a little bit, and that's exactly what Satan wants you to believe. Once you're good and relaxed, he gets easy pickings on your relationships, your values, and your habits. Peace builds expectations that it will last, but on this earth, there will be trouble! So enjoy times of peace, but stay vigilant in your watch for danger. Luxury - One of the most challenging distractions is abundance. You can attempt to satisfy all of your needs and manage all of your emotions with stuff—shopping, eating, and over indulging. David states in Psalm 119 that a young man can keep his way pure by hiding God's Word in his heart. This is such a simple practice that is an incredibly effective way for dwelling on Truth. We have been selecting at least one verse to memorize that stands out to us as we read through each book of the Bible. A great system for keeping up with your memory work is Charlotte Masons's memory system. When I was young, my dad taught me to slow down and think about God's Word. He called it "chewing the cud"...such a lovely picture, but it did give me a visual of how slowly cows work on chewing and digesting their food. They even pull it back up to chew some more before they are truly finished gleaning all of the nutrients out of their meal. As we've been reading through the Bible together as a family, I've also been dwelling on John chapter 1 in my personal quiet times. I think I've spent the last five months on this chapter. It feels a little silly because my American mind thinks I need to make better time, be more efficient, and cover more territory to find success. However, my soul has been renewed, and my mind has been re-energized by the richness of God's Word. It's worth the time meditating and dwelling. Really there is no better way to commune with God than prayer. It is His gift to us as His children. He's offered a way in which we can talk directly to Him about our worries, fears, triumphs, and blessings. Focus on the Family offers some simple ways to equip your children with communicating with God in prayer. Sometimes we try to make things more difficult than it really needs to be. Paul tells the Philippians that they should think on things that are true (Phil 4:8). If this is the case, a great way to provide a wealth of true things to think of is to use catechisms. This art centers around memorizing simple answers to basic questions about the nature of God and the nature of man. We really like the New City Catechism as it offers a simple way to work through key points of doctrine that will help children give an answer for the hope that they have (1 Peter 3:15). It's not that these pieces of information are overly spiritual, but they offer a framework for adding further knowledge and understanding in order that they might become wise. There is no greater way to keep your eyes fixed on Jesus than to center your conversations around the truth of God's Word. When you discuss His Word, you are not only encouraging others with His truth, but you're also reminding yourself of what great things God has taught you. I believe we truly don't understand anything until we've had the opportunity to wrestle with it in conversation. You think you know something, and then you discover how foggy your ideas are when you try to share them with someone else. It's in that discussion that the fog clears and understanding is achieved. When I was a freshman in college, I lived in the dorm with hundreds of other girls. God placed me on a hall where I had about a dozen godly young women who were passionate about knowing God and making Him known. 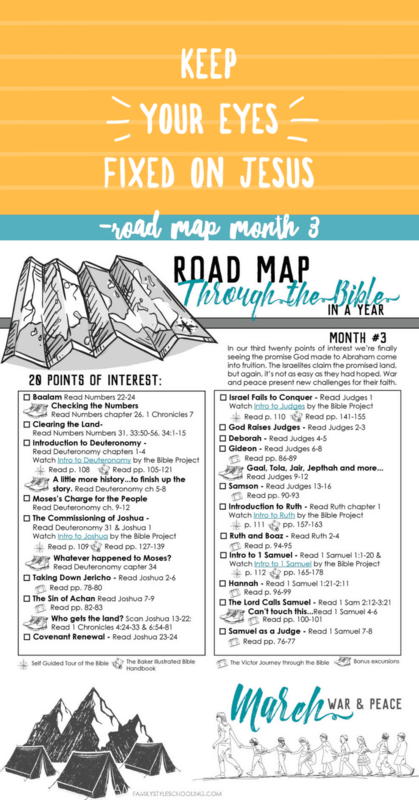 My faith was strengthened that year as we discussed what God was revealing to us through His Word. The amazing thing is that when I was discouraged, I could go down the hall and hear of God's faithfulness and goodness and my heart would be refreshed. I could also return that favor when others were feeling down. We blessed one another through conversations about God's Word. 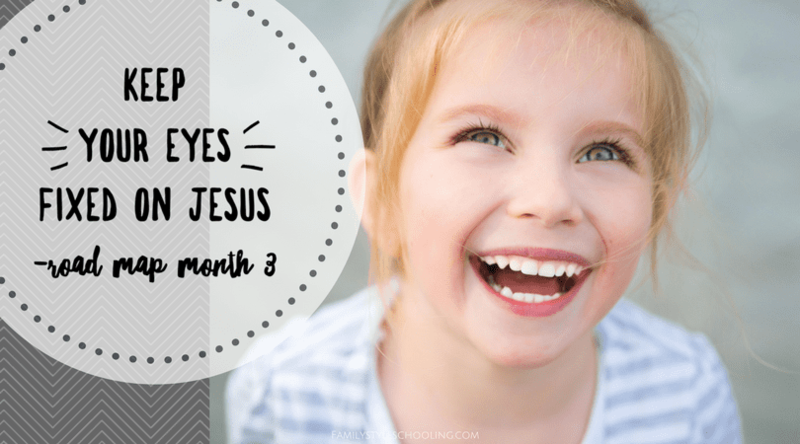 Give your kids the big picture of scripture and help your family keep their eyes fixed on Jesus. If we learn anything from reading through the Old Testament, we should learn that we cannot find success in isolation. We need one another!